We are delighted to present the fantastic Pack of 10 - MiniSun 15mm LED Round Garden Decking / Kitchen Plinth Lights Kit - IP67. With so many on offer right now, it is good to have a brand you can trust. The Pack of 10 - MiniSun 15mm LED Round Garden Decking / Kitchen Plinth Lights Kit - IP67 is certainly that and will be a perfect purchase. For this reduced price, the Pack of 10 - MiniSun 15mm LED Round Garden Decking / Kitchen Plinth Lights Kit - IP67 comes highly respected and is always a regular choice amongst most people. MiniSun have added some great touches and this results in good value for money. 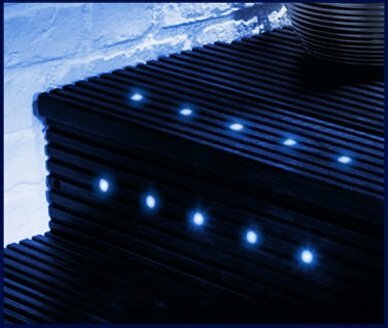 These LED's light up your decking beautifully. This kit includes: 10 x 15mm LED decking lights (1.5 m of cable in between each light). 5m cable from transformer to very first light.